In the three states of Chhattisgarh, Rajasthan and Madhya Pradesh, Congress now has to deal with rival claims to the chief minister’s post. New Delhi: The race to the chief ministerial chair has begun as Congress seems all set to form governments in Madhya Pradesh, Rajasthan and Chhattisgarh. In Madhya Pradesh, senior Congress leader and state party chief Kamal Nath is tipped to be the chief minister. In Rajasthan, the party leadership has to choose between veteran leader Ashok Gehlot and state unit chief Sachin Pilot. In Chhattisgarh, where the Congress swept the elections, the party has to decide among state Congress chief Bhupesh Baghel, parliamentarian and the party’s OBC face Tamradhwaj Sahu, and leader of the opposition in the assembly T.S. Singh Deo. The party is currently leading in the three states. It lost in Telangana and Mizoram. Sources said Nath is likely to be the first choice in Madhya Pradesh as he enjoys not only the support of the party MLAs but also of veterans like former chief minister Digvijay Singh, who prefer him to Jyotiraditya Scindia, the campaign committee chairman. Party workers in the state Tuesday put up posters of Nath, who spearheaded the campaign, as the chief ministerial candidate. In Rajasthan, the entire campaign was led by Pilot and Gehlot, to the extent that it had led to infighting within the party too. The party leadership had remained mum on the question on who will lead the party in the state. Soon after trends indicated a Congress win in Rajasthan, both the leaders maintained that the question will be settled by the party MLAs, leadership and Congress president Rahul Gandhi. 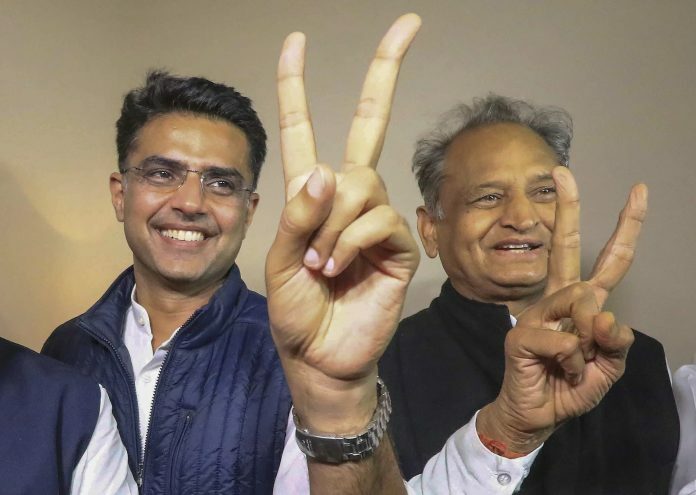 However, as the party looked headed to win Rajasthan with a narrow margin, a section of Congress leaders said that Gehlot, a two-term chief minister, could be a better bet. But Gandhi could find it difficult to ignore the claims of Pilot, who left his family in Delhi to hit the streets and keep the heat on the Bharatiya Janata Party (BJP) government for close to five years. The party has convened a meeting of its newly-elected legislature party (CLP) Wednesday to elect its leader. The central leadership is likely to take a call on this soon, though Gandhi has not spoken on the issue yet. “A final decision would be taken soon,” added the leader. In Chhattisgarh, a meeting of the MLAs is likely to take place Wednesday to assess the situation following which a decision will be taken, said a senior Congress leader from the state. “Right now, candidates are still waiting to get their certificates,” added the second leader.